BELIEVE IN GHOSTS: to the max! 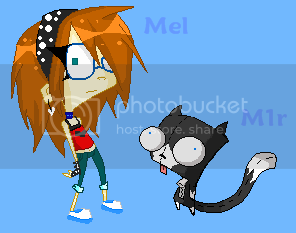 Mel is a random and not so very bright girl, but wen it comes to her family and friends, she's a ticking time bomb waiting to go boom...She has a few friends but they don't keep contact with her because of her strong beliefs in the paranoia, like ghost, the chupacabra, even....Aliens! 8O!!! well anyway you get the point. She lives in a crappy neighborhood but she deals with it very well. In her home she lives with a controlling mother, so controlling, Mel couldn't go to the bathroom alone with out her mother knowing were she is...her father is a fun outgoing grown up, even thought he his always on his wife's side even thought she mostly wrong...but he gives Mel a heads up wen ever she needs it. Her older brother Eric, is a total gamer addicted to the game systems, 24/7, he is always in is room playing games till the the morning to the next, Mel as a small robot stuff't cat named M1r, she didn't make it or anything, she found her in the junk yard near her home wile she was taking a stroll to her school one morning. NEXT TIME, Dont post in the RP until this profile thin of your is Approved by Ziiiiiiiiim. Mel is WAY more coplex and awesome then Kat.